Now that the lovely holidays are essentially wrapped up... We can hop back into the last two rooms on our house tour. Better late than never right? I mean we haven't lived here for almost 6 months or anything. So if you ever feel like stopping through the area.. please let us know because we have a wonderful guest bedroom all prepared for visitors from near and far. And it is just that.. a guest bedroom. Nothing else. Which just reiterates how old I am getting. Entering into the room.. all of my books call this room home. Do excuse Klutch and Piston.. they wanted to help with the tour. I've always had a hard time figuring out how to display them. Eventually I'd love some custom shelves for the dining room. Our old bed set is the guest bedroom set. So I basically just transferred the decorations I had. I'm still not sold on the wall art. Or lack thereof. I feel like the room is sort of empty and blah, which is probably why I feel these pictures do no justice. Anyway when you first enter there is the wall.. which houses my bookshelf and all of my books, plus a few Army momentos. The bed, nightstands and a dresser are the only furniture in the room. On top of the dresser is my shot glass collection on a set of shelves. I collect, in case you didn't notice. Haha. Obviously the picture frames still need filled. We are out of ink though.. and I've been a bum about getting new ink. So who knows how long they will sit empty. This is also the only room with curtains since they transferred over as well. Finally, my purses, luggage and all other bags are in this room as well. My absolute favorite part of it just being Rob and I in a 3 bedroom house, is that the closets are free to do whatever with. That makes a purse girl very very happy. Nothing special. I feel if we could paint the rooms I'd be so much more excited about showing off what we've come up with. However, the yellow/beigey color that is throughout the house, just makes the pictures look dull and the rooms in general just look kind of lackluster. 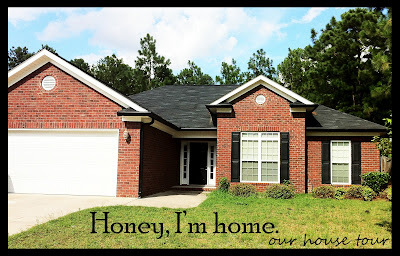 I'm thinking of AND READY for the future.. when we aren't renters, but owners! Be on the lookout for the final room.. the master bedroom.. sometime in the future. Love it! It's so cozy and inviting! I know what you mean about just having it be a guest room. Our guest room is an office, china cabinet, and guest room. It's cute! I love your shot collection! I like your spare bedroom :) When we had one, we didn't have a clue as to what to do with it, so it just became a catch all room. it looks great! :) my bookshelf space is overgrowing.